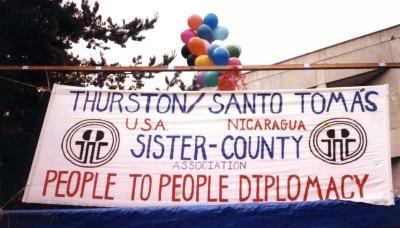 Learn about the upcoming Olympia community delegation to our sister town of Santo Tomas , Chontales , Nicaragua , in early July 2011; attend this presentation (with assessment of your interests)! Imagine yourself with family, friends and neighbors in the small town of Santo Tomas for 11 days on a very supported, family friendly, language interpreted, and affordable experience (or a longer, 23 day version if your Spanish language skills are moderately strong). Live with host families and reconnect with the 29 Nicaraguan friends we�ve met on delegations to Olympia over the past 21 years. Participate in a volunteer opportunity prioritized by our sister organization � perhaps in a classroom at Lincoln Elementary's sister school, a construction project, health clinic work, web page development, cultural workshop, or something else. Learn from local experts in Sto. Tomas about Nicaragua's challenges and what role the US has historically (and currently) played. Spanish language interpretation will be provided for the group during the 11 day trip to accommodate Olympians with low-level Spanish language skills. The TSTSCA has long supported Lincoln Elementary being "sistered" with Escuela Ruben Dario in Santo Tomas, which has included a two-way exchange of visitors. Please help us get the word out to people who might appreciate visiting our sister town/county in Chontales, Nicaragua while building on a long-term relationship. Grace Cox and Jean Eberhardt will lead this summer's delegation, which you won't want to miss! Contact the Thurston-Santo Tom�s Sister County Association via email or phone: (360) 943-8642.